When the winter comes, not only that is colder, we stay more inside, and eventually the snow will fall. 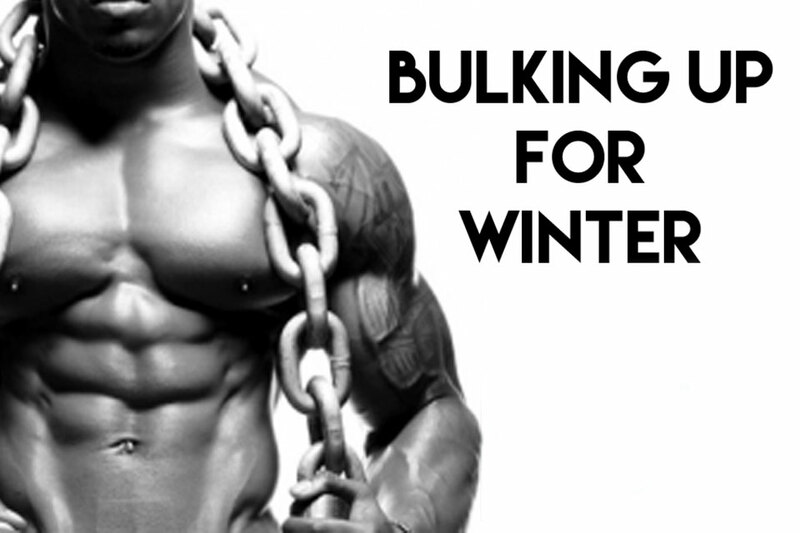 For the gym crew and bodybuilding enthusiasts fall/winter means, bulking season. That means that a lot of people are trying to get as much mass gain as possible, but not always the mass is muscle, a lot of times is more fat or water than the muscle. In this article I will try to shed some light on bulking, and the things to watch out for, and how to do it properly. But bulking means, calorie surplus. More calories, more weight, but what kind of weight? I want to talk about junk food first, because people think that bulking means, eat whatever you want, train and the muscle will grow like crazy, if you are thinking only about size your arms, not thinking about body fat or definition of the muscle, that’s your way to go. But for me, bulking means to gain as much muscle mass as possible and as less fat as possible. It’s hard to eat everything and not counting calories too much, and not to gain fat, but when you are bulking, you have excuse, “I’ll have that burger and fries, because I am bulking”. I know a lot of people that have done 2-3 cheat days per week to start bulking, and eventually they were cheating/junking every day, because it becomes a habit, and few weeks later, they had 10 pounds of fat, even they have worked out. Bulking does not mean, eat junk and you will be okay, you can eat it sometimes, but not too often. There is two different kinds of bulking, clean and dirty. Based on your lifestyle, food choices or something else, find one that works the best for you. With this technique you will gain smallest amount of fat in your bulking process. Distribute your calories and macros carefully, your body needs a lots of stuff during day and night. Macros: 1-1.5 gram of protein per pound of bodyweight, 2 grams of carbohydrates per pound of bodyweight, and the 0.20-0.30 grams of fat per pound of bodyweight. Training: During your bulking period, your workouts should be heavy, 4-6 reps, focus on your 1 rep max during your bulking, because you’ll have a lot of energy coming from your carbs, and you need to use it. Food: For your protein sources; meat, eggs, cheese, fish. For carbs choose whole grain; oats, sweet potato, barley, fruits. Fats; yolk, nuts, olive oil. For every meal, try to have some veggies; broccoli, peas, beans, carrot, peppers, tomato. Dirty bulking is just eating whatever that has calories and protein. If your lifestyle doesn’t support clean diet, and you can’t do a clean bulk, and your only choice is dirty bulk, it’s okay. Macros: you need to eat 1-1.5 grams of protein per pound of bodyweight and for fats and carbs there is no calculation, because mainly you eat everything. Training: must be as hard as possible, every now and then, add a 10 minute cardio at the end of your workout, and after do just one more exercise for a muscle group that you have been working that day; example, if you are doing back, do a 10 minute jog on a treadmill and after do a 4 sets of pullups, max repetitions. Food: Everything, if you are dirty bulking, eat what you like, what makes you happy, and a lot of protein. Benefits of dirty bulking is that you can eat what you want/like and that has a great influence on your mindset. Taking a break from your strict diet, meal plan, and all of those things. Give yourself a couple of months of mind training, minimize stress about nutrition, but don’t forget to come back on track. What to take in order to bulk as big as fast as possible? Whey – bulking or not, you need protein. Whey is the best post workout food/shake. Creatine – Choose what kind of creatine you want/need, but watch out for water retention. Multivitamin – You’ll need a lot of vitamins to help speed up your recovery and your gains. Mass gainer – Lot of calories, lot of strength and a lot of gains. Build some serious mass. BCAA – Push your protein synthesis to maximum, help your body to make new muscle. Compound movements will help you produce more growth hormone, and you can assume what will growth hormone do with your muscles. Drink at least one gallon of water every day. If you are working hard, eating a lot, you will need a lot of rest. Sleep at least eight hours every night, and try to incorporate a power nap, for me it was always helpful to take a power nap (20 minutes) after my workout and after my post workout meal, it helps me to reduce cortisol levels after working out. One of most important things in your life is positive thinking. Your job, fitness, success, happiness depends on positive thinking, you can’t have a good workout without your mindset pushing you past your limits. Go out your comfort zone and push yourself past your limits. You are eating a lot, but two most important meals are, pre workout and post workout. Pre workout meal will give you needed calories to lift heavy, and you need to try to burn them all with heavy lifts and maybe you will need to be in the gym a little bit longer than usual, do a bit more sets than usual. Post workout meal will give you protein for muscle repair, carbs for helping your muscle recovery, and supplements for muscle growth. Check our article on Pre & Post Workout nutrition! Having goals for every 90 days is one of the best ways to progress. But you need to track your progress every week. Measurements, your bodyweight, taking pictures every week, this all will help you a lot. It is a very crucial to track your progress because you can see if you are going in a wanted direction, and you can correct some things if you see them on time. Change your routine for bulking, maybe some old school working out routine will do the trick, or some newer like FST-7, it is up to you. But change two or three routines during your bulking period. It will help you to shock your muscles into growth. Focus on 4-12 repetitions range, focus on strength and on quality of the movement. Maximize your workouts with stretches. After every training session, stretch that muscle group for ten to fifteen minutes. Hold every stretch/move for at least fifteen seconds, never hold less than ten seconds. Also, warm up properly before you work out, let the blood flow into your muscles, elevate your heart rate, and prepare your mindset with some motivational videos.